So as not to miss the UPS guy delivering my much anticipated new spinning wheel, I am sitting at home all day. To occupy my time (in between some real work), I am spinning up this footnotes unspun from Fiber Optic. 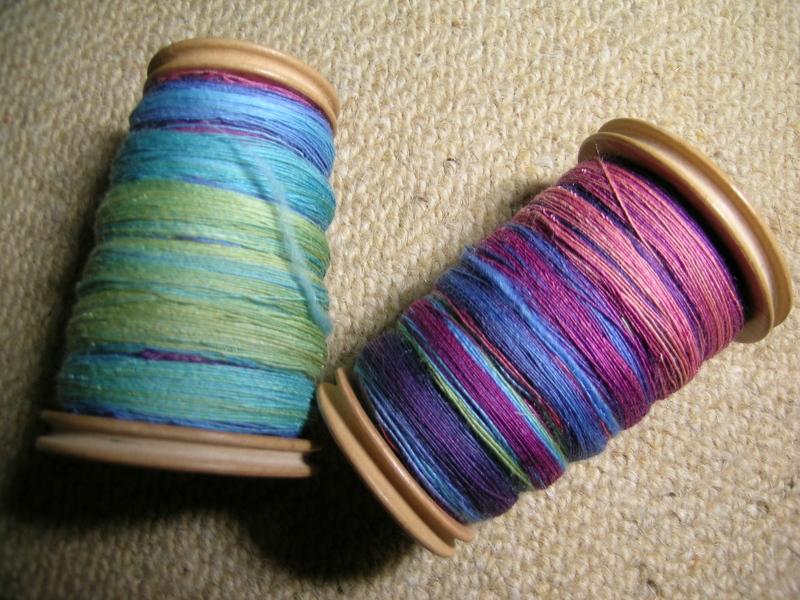 This has to be my favorite fiber to spin, it is pencil roving and easily splits right down the center. No predrafting is required, and I swear that it spins up faster. 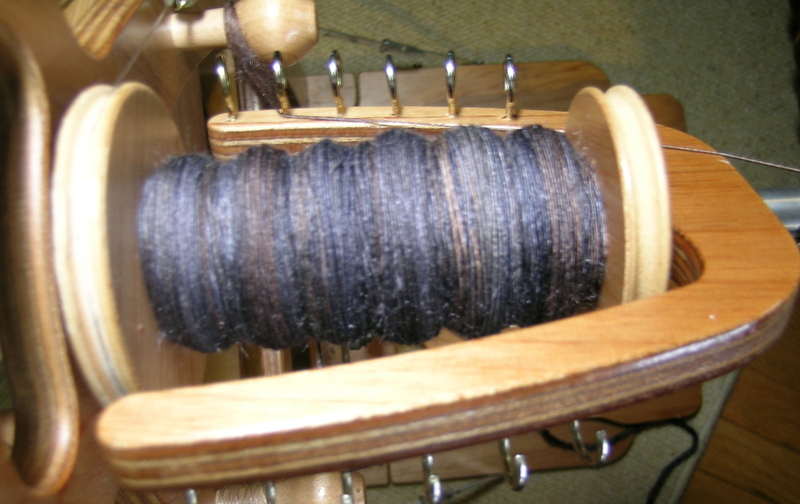 The color is Black Coffee, and it is a wonderful blend of darks, very subtle and deep. 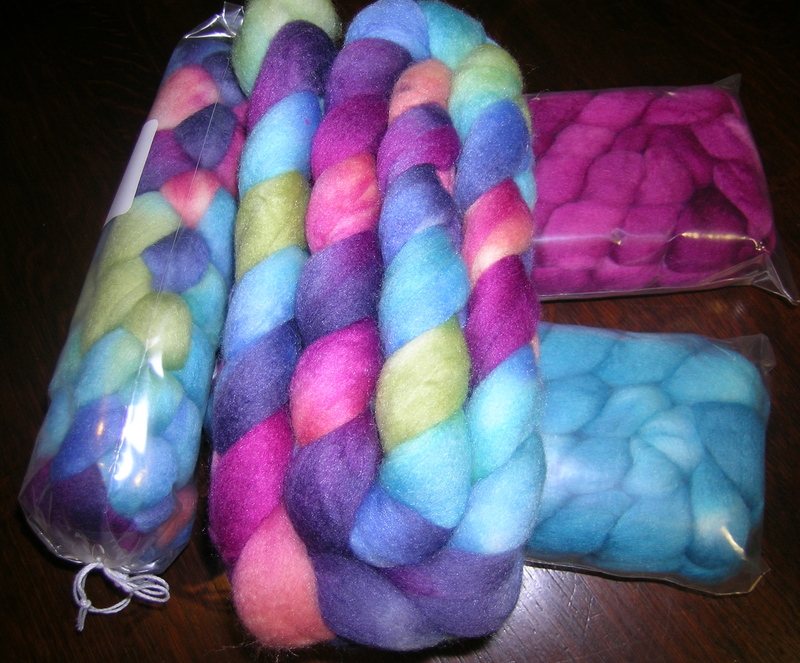 The yarn is destined to become some handknit socks for my husband (superwash merino + silk). This is for the April Sash busters on the Fiber Optic group on Ravelry. I think that I will make the deadline. I finally finished the singles of this multi-colored fiber from IntoTheWhirled that was part of Feb/March SAL, and that deadline missed. 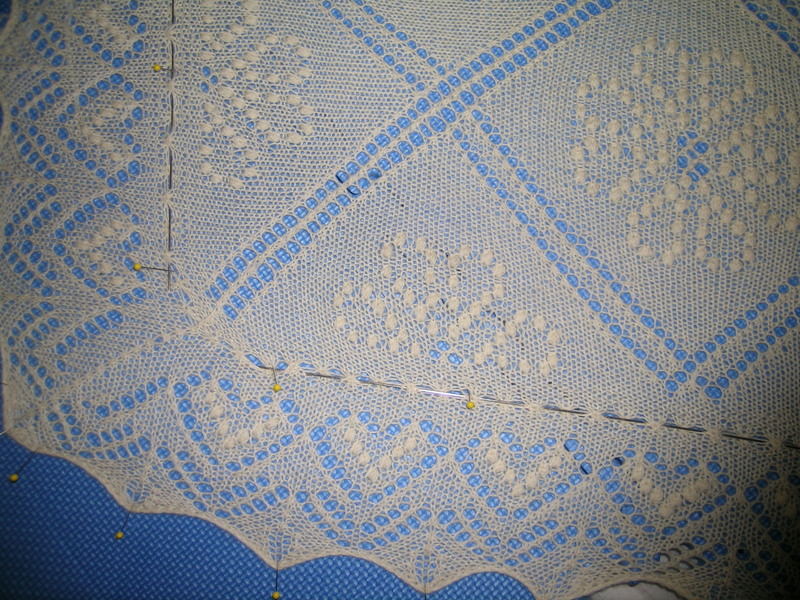 I am really debating plying these 2 together or plying one with it’s coordinating pink singles, and one with the coordinating blue singles. 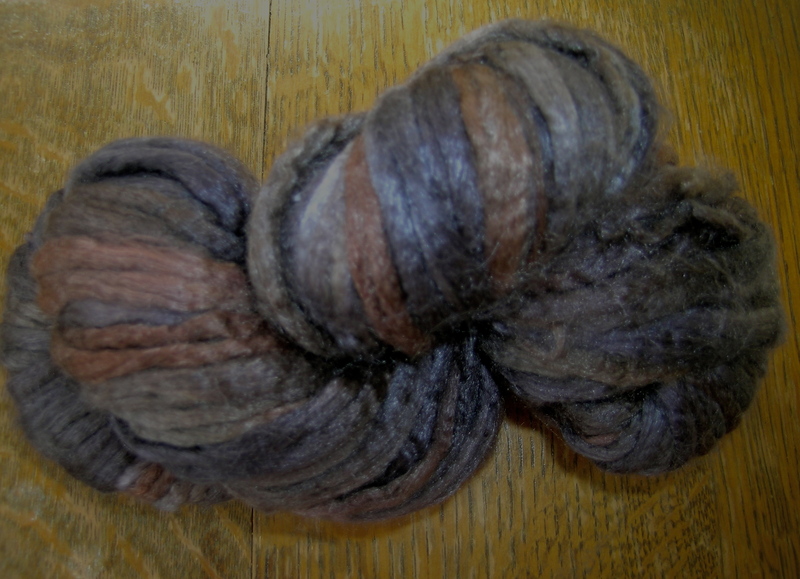 I worry about the yarn becoming muddied if the variegated is plyed with itself. 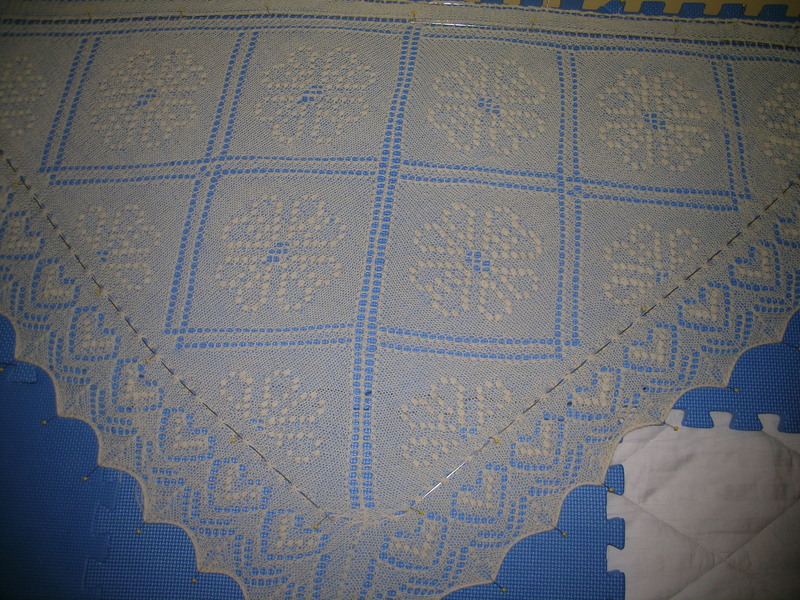 And, I pulled the Greta Garbo shawl off the blocking boards and am weaving in ends. In theory I should only have the beginning and end threads to weave in (spit-spliced the 2 skeins during knitting), but if you remember my row of shall we say “wine induced nupps”, I had to catch several of those and that gives me many additional ends to weave in. Remember my post from the CookieA weekend? She wrote a wonderful post on her blog about our group, and I got a double shout-out! Okay, I am dying to know….what wheel did you buy? I bought my Lendrum and after trying all the ones Fiber Garden had at our class, I am so happy with my purchase. I love my wheel. Don’t spin enough but I will soon….. Check in to morrow and I will have photos! Hopefully it will not take me too long to put it together.